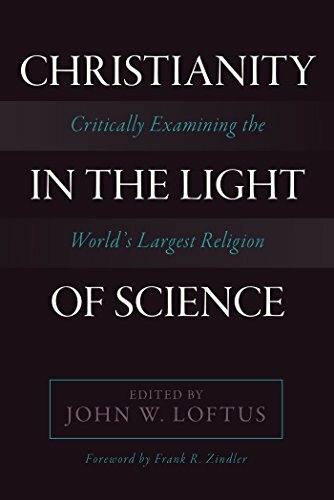 Amazon.com description: Product Description: This anthology of new critical essays written by experts in their fields, in honor of the late Victor Stenger, examines Christianity using established scientific criteria. Where science specifically touches upon the claims of Christianity the authors seek to show those claims lack the required evidence. The result is that Christianity is not a sufficiently evidenced religion. In his New York Times bestseller, God: The Failed Hypothesis, physicist Victor Stenger argued that claims of religion should be subject to the same standards of scientific rigor as any other truth claim. Taking this approach, the contributors argue that Christianity fails every known scientific test for truth. Stenger himself wrote a chapter for this volume before he died.Â In it he presents a brief history of ideas about cosmology, showing that Christianityâs premodern understanding of the cosmos is incompatible with current scientific evidence regarding the origin and structure of the cosmos. Other contributors examine a wide variety of topics, including biblical archaeology, Intelligent Design, the Shroud of Turin, free will, the existence of the soul, the efficacy of petitionary prayer, and more. This challenging work is indispensable reading for both skeptical readers and open-minded people of faith.